This article aims to outline the distributed agency within the creation of computer-generated characters for live-action movies that use Motion Capture techniques. This technique requires a tight interplay between human actors, technical artefacts and digital processes. With the help of ANT the relationships within this heterogeneous collective can be presented more precisely in order to assign agency to human and non-human participants. Considerations concerning a combined interplay of humans and computer-driven actions result in the figure of the hybrid actor. Gollum, a computer-generated character from Peter Jackson's adaptation of the Lord of the Rings, serves as case example to carve out the attributes of this composite agent. The aim of the article is to show how these types of agents tackle the film industry's inherent ontology revolving around human actors and their products. The article contributes an insight how the mentioned network reacts to the emerging problem of crediting in the context of Motion Capture as technical innovation and how the involved community preserves their notion of artistry. A film production can be considered a place and an event, where the interwoven rapports between human and non-human entities serve as foundation for the creation of movies. The collaborative efforts, the amount of delegations and the inherent division of labour within this complex collective result in the exclusion of singular authorship and the sheer impossibility of unmediated, autonomous actions. For me it represents a situation in which humans and technology are of equal importance and through advancing technology and upcoming innovations the relationships within this heterogeneous collective constantly grow tighter and stronger. To the same degree I tried to sketch very shortly in a former essay titled “No actor acts alone”. In all places and situations where humans form a collective with machines, technological artefacts and specific scientific knowledge Actor-Network Theory seems not to be far away; as one of its main efforts consists in integrating these non-human participants into the network. By contextually examining different networks ANT bypasses the subject-object dichotomy that classic sociology is based upon and treats human and non-human forces symmetrically. Bruno Latour, the main proponent and sporadic critic of ANT, has a far bigger goal in mind when defining a “collective”, which he uses for the term society in the course of events. In the context of my article with “collective” I refer to very specialized and numerously limited networks, although as we will discover, they are by no means small. Although cinema as an art form, based on its production modalities has always indicated a distribution of agency, the preeminent notion of monocausal creative process still seems to cling to it. Despite being a highly proficiency-oriented and technologized enterprise, the notion of the artists’ creative invention is essential to both filmmakers and their public. Thus the film industry appears as a system established around human actors and their products. The aim is not to present another claim that action is distributed among human and technological entities. Rather, the “sociotechnical order” (Law, 1991, p.10) is the starting point of investigation. The intention is to “uphold the sensitivity to complexity” (Gad& Jensen, 2010, p.59) of the examined network and integrate its own range of reactions to the emerging challenges. In this article I will address some aspects of digital filmmaking and focus on one specific technique among the emerging technologies of cinematic representation that allows us to defy the conventional categorizations. Through the use of a technique called Motion Capture, filmmakers are able to create computer generated (shortened CG) characters whose movements are not artificially calculated; but recorded from a human animator and then transformed into data for further editing. By analysing Motion Capture (Mocap in short) we get an insight into the complex collaborative effort in creating a synthetic character. Mocap technique – which falls between classic live-action recording and animation - can still be considered a developing technique and has its on-going proponents as well as opponents in the community of filmmakers. Its disputed and instable position within the mentioned complex network can be regarded indicative for Hollywood’s relatively narrow recognition of actors. The increasing use of Mocap in current film productions can provide an insight under what circumstances and regulatory obstacles this deviceful technique is incrementally adopted by the film community. I will try to explore how this technological innovation challenges the scheme of crediting and actor attribution in the film industry. To illustrate the use and functions of Mocap in my case example I will put a finer point to the genesis of perhaps the most popular hybrid character in recent cinematography: Gollum, the monstrous and temperamentally ambivalent creature from Peter Jackson’s Middle Earth. In the course of investigation this digitally co-created film character might turn out to serve as a paradigmatic figuration for one of Latour’s essential terms – the new composite agent: the hybrid actor. The filmic Gollum was the first computer-generated character in a main role to provoke a symptomatic critical debate about the attribution of agency and co-action of human actors with technological artefacts among filmmakers, producers and critics. The industry’s internal dispute should be taken into consideration, as “one can never isolate pure concepts from the socio-technical networks that shape them.” (Gad & Jensen, 2010, p.56) The debate among media industry signalizes that the reflection on attribution of agency is not only subject to theoretical perspectives. Reaction to its issues can be traced in the network itself and thus description and examination cannot be separated from its multiple movements and its own constant transformation. 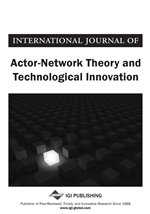 Political and economical conditions, scientific progress in film technology and the various networks of human participants with deviating interests result in complex, reflexive and overlapping networks.